The soothing sound of this chime is the result of a special tuning using the "golden ratio". This ratio, discovered by the ancient Greeks, can be found throughout nature. It's said that Red Jasper can eliminate negativity, help clear your the mind during meditation or prayer, and help you people remember your their dreams. It's also a stone of protection. 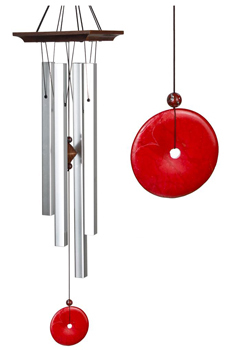 Let The music from this chime will fill your customers' home or garden with an aura of positive energy.